Transparency Market Research (TMR) has published a new report titled, “Cast saw devices Market - Global Industry Analysis, Size, Share, Growth, Trends, and Forecast, 2018–2026”. According to the report, the global cast saw devices market was valued at US$ 150 Mn in 2017. It is projected to expand at a CAGR of 4% from 2018 to 2026. The report suggests that growing burden of osteoporosis and rise in incidence of non-fatal injuries are anticipated to boost the global cast saw devices market from 2018 to 2026. 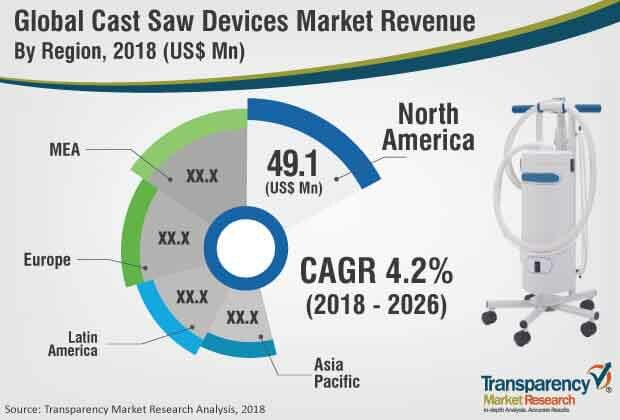 North America and Europe are expected to dominate the global cast saw devices market in the next few years, owing to new product launches, demand for technologically advanced cast saw devices, and prominent surgery rate in these regions. They also enter into distribution agreements to strengthen their footprint across the globe. Key distributors include Atlas International, a distributor for cast removal device manufacturers, such as Stryker, Oscimed SA, Hebu Medical, and De Soutter Medical, in the U.S.
McArthur Medical Sales, Inc. is the sole distributor for BSN Cast Removal product line in Canada. In Asia Pacific, players such as BSN medical (acquired by Essity Aktiebolag) and De Soutter Medical sell their cast removal products either directly or through distributors, or other players. In markets such as India, Australia, and New Zealand, BSN medical sells its products through its own sales force. BSN medical also acts as a distributor for De Soutter cast saws, such as CC4 cast saw. De Soutter Medical sells its products including CC4 and CC5 cast saws in countries such as Australia through distributors such as Smith & Nephew. Oscimed SA sells its products in Japan through its distributor, Muranaka Medical Instruments Ltd. The report offers detailed segmentation of the global cast saw devices market. Based on saw type, the electric saw without vacuum segment is likely to expand at a significant growth rate during the forecast period. Expansion of the electric saw without vacuum segment can be attributed to the utility as well as cost associated with the device, which is significantly lower, as compared to that of the other saw types. The battery operated saw segment held relatively minor share of the market in 2017. It is anticipated to lose market share by the end of 2026, due to rise in demand for electric saw with vacuum cast saw devices. In terms of application, the fiberglass cast removal segment is anticipated to expand at a rapid pace during the forecast period. This segment is likely to exhibit significant market attractiveness in the near future. Expansion of the fiberglass cast removal segment is attributed to the increasing preference for fiberglass cast over traditional plaster of Paris cast among patients as well as doctors and orthopedic cast technicians. In terms of end-user, the global cast saw devices market has been divided into hospitals, clinics, and ambulatory surgery centers. The hospitals segment held a notable share of the market in 2017, as most trauma cases and those related to fractures are handled by hospitals. Additionally, increasing investments in hospitals across the globe is expected to further boost the segment during the forecast period. Clinics is anticipated to be the second-most lucrative segment and is expected to exhibit a significant attractiveness index during the forecast period. In terms of revenue, North America dominated the global cast saw devices market in 2017. The cast saw devices market in Asia Pacific is anticipated to expand at a considerable pace during the forecast period. Major factors attributed to the large demand for cast saw devices in Asia Pacific are high frequency of road accidents and injuries and ever-growing population in South Asia and China. According to the Australian Bureau of Infrastructure, Transport and Regional Economics, there were an estimated 5.08 deaths per 100,000 due to road accidents in 2015. Japan recorded an increase in number of deaths due to road accidents, around 4,117 deaths in 2015; as reported by the National Police Agency of Japan. The report also provides profiles of leading players operating in the global cast saw devices market. The cast saw devices market is largely consolidated, with top two players accounting for around 50% market share. Market players such as BSN medical and Stryker Corporation dominate the global cast saw devices market. BSN medical (acquired by Esssity) accounted for a prominent share at of the market, in terms of value and volume, in 2017. The company dominated the market due to its wide product portfolio and extensive presence in diverse geographies. The company sells its products through its own salesforce in major markets and through distributors in select geographies. Stryker Corporation followed BSN medical, in terms of share of the cast saw devices market, in terms of value. Other players such as De Soutter Medical, HEBU Medical, OSCIMED SA, and smaller regional players with presence in select regions accounted for the remaining share (value and volume) of the global cast saw devices market.